We Make Your Private Documents Disappear! Enjoy convenient on-site shredding from Magic Shred in Denton, Texas. We offer protected file disposal services to commercial businesses and local residents. 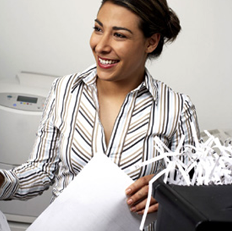 A dependable monthly shredding service is available if your business requires frequent protected file disposal. With the monthly service, you receive your own secure containers to fill. More frequent shredding is available upon request, and one-time purges are also an option. On-site shredding offers the ultimate in information security. Your confidential materials are picked up in locked containers and brought directly to our shredding truck. The truck’s hydraulic lift raises your container to the shredder and your papers are shredded in minutes. Each high-tech shredding truck from our mobile document shredding company is equipped with a camera and video monitoring system. This allows both our driver and you to verify that all confidential information has been shredded on-site. For one-time shred jobs comprised of less than four boxes, it is typically more affordable and convenient for you to take your documents to one of our drop-off locations listed on our site. This protected file disposal service is perfect for smaller shredding jobs. Six drop-off sites are available for your convenience. Make your private documents disappear!